In Now Playing articles PC Gamer writers talk about the game currently dominating their spare time. Today Tom goes evil, shows no remorse. Do you love to snipe in multiplayer shooters? You’re a jerk. What’s more, I think deep down you know it. I say this with confidence because I have joined your club of murderous voyeurs. I have camped in the shadows and ruined others’ fun with each click of the left mouse button. I have punished players for having the temerity to wander around outside, and I’ve shot a few inside, too. People in videogame war zones don’t tend to board up windows for some reason. Titanfall 2 is my war zone of choice at the moment, and the Double Take rifle is my weapon of choice. Its double-barrelled laser shots are wide enough to help my poor aim, and lasers don’t suffer from bullet drop. After years of Battlefield, it’s a relief to use a gun that shoots where I point it. The drawback is that it takes two shots to kill a foe, but the Double Take fires quickly and has a forgiving clip size. Essentially, it’s a sniper rifle for players who don’t think of themselves as snipers. It’s a gateway drug. It is the path to the dark side. It’s great, it turns out. 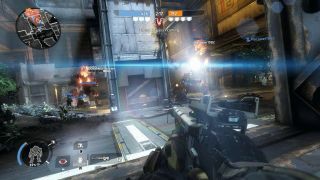 Once I used Titanfall 2’s splendid wallrunning to strafe enemies with a roaring submachine gun, and I used its jet-powered double jumps to mount titans and rip their power cores out with my bare hands. Now, I scale sheer walls to find hidden spots with good sight lines. I used to play as a spindly droid with a speed boost power; now I’m a chunky ghillied-up chucklefuck with an invisibility cloak. If someone figures out where I am I press a button and Keyser Soze the hell out of there. I’m used to frantic close-range scuffles with scrappily thrown grenades and the occasional hopeful knife swing. The sniper’s game is very different. I’m now familiar with a variety of common victim behaviours. There’s the one who zigzags and bounces when they realise sniper fire is coming; the one who spins around on the spot looking for me, which makes things very easy; and the one who scans the rooftops and starts shooting back as I take aim. I wouldn’t say Titanfall 2 is a calmer game played this way. I am my own worst enemy most of the time. Sometimes, when I have a perfect shot, I tense up completely. Just when my cowering is supposed to pay off I choke and put shot after shot wide, high and low. I can’t deny the thrill, though. At first I tried to justify it to myself—‘the developers designed it this way, this is how these guns are supposed to be used’ and so on. But I have come to enjoy the power imbalance between shooter and victim. There’s the sense of superiority that comes with it. I don’t even know why I should feel superior, it’s less of a fair fight than a scrap with an SMG, but there’s a certain loftiness to taking aim from half a mile away. It’s a cool way to score points. It’s the ungentlemanly way to kill a player. But that’s what I am now: An ungentleman. A jerk.